Pittsburg is a winter wonderland with a worldwide reputation for great snowmobiling! 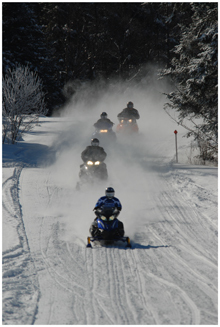 Deep winter snows and dedicated, hard-working snowmobile club members make Pittsburg, NH a premier New England winter destination. With over 170 inches of annual snowfall, Pittsburg is blessed with deep snow from Christmas to the first week in April. With nearly 200 miles of groomed trail just within Pittsburg, you seldom ride on the same trail twice! Our trails connect to Vermont, Maine, and Quebec for an unequalled variety of riding. Most lodges, restaurants, stores and serices are trailside in Pittsburg. Park your vehicle and ride the trails wherever you need to go! Deer and moose are commonly seen along the trails. Drive to a high mountain peak for breathtaking views of our area’s mountains and lakes. Natural beauty, miles of groomed trails and deep winter snow are the reason Pittsburg is the #1 New England snowmobile destination!